Hello! I hope you have had a good week? 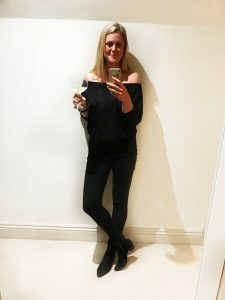 I am back with another blog featuring Baukjen– which I an utterly delighted about. The last three I did for them got such a great response from my blog subscribers as well as followers on social media that they have renewed my contract and asked me to do another series over the next three months. Not only is this great on a basic level as I LOVE their clothes and am always recommending them to clients…but what really feels good is that they gave me the chance to prove my theory that customers want and appreciate fashion brands making the effort to help them to know what would work for them from their collection and what to avoid as it wont flatter. They appreciate brands diversifying how they market their products to their audience and not just solely using influencers to “sell” their clothes; as in the evidence I see every day proves that this does not help a vast majority of their target audience- in fact it often confuses and hinders many of them. This results in high returns, loss of trust and low repeat business for the brand. And for their customers? Well they are left feeling rubbish about themselves as they did not look like that particular influencer did in that skirt and they then blame themselves/their weight/their height/their mum tum…anything- without realising that these feelings could have been prevented had the brand given them advice alongside their collection as to who the pieces would suit and who should avoid them according to their colouring / body shape/height etc. I have been banging this drum for the last 18 months and will keep on doing so until more brands begin to realise this….as I am so passionate in helping people feel good about themselves and preventing a situation that could be so easily avoided with just a bit more thought and an open mind within their marketing strategy. So- my first blog is going to be on “capsule pieces” for spring/summer. I chose these because they won’t date, you will get value for money due to the cost per wear and due to the quality- they will last. Once you have “plugged” gaps in your wardrobe at the beginning of the season- then you can start to have fun with the more frivolous, fashionable and fancy pieces. It’s a bit like food; fill yourself up with good, nutritious food that helps your body to function effectively and then you can have the odd “treat” that won’t sustain your energy or starve off your appetite until supper- but it sure as hell brings you a moment of joy! This more relaxed style of shirt is great for all things when you don’t have to be “corporate”. The soft cotton is going to be flattering for curves and it comes in white, navy and stone. 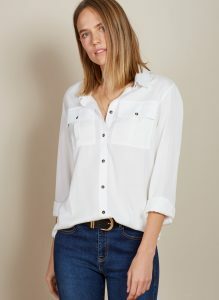 I would wear this with cut off jeans or chinos in the summer but similarly, I would wear it with leather trousers and a jersey jacket in the winter….so even though it is in the spring collection- it is a definite all rounder! Be careful: if you have a full bust as the pockets on the bust will do you no favors. Ps. I love the styling of the black and navy together in this picture. People always ask me about navy and black together; personally I have no problem with it (apart from which colour is next to your face….for most people it would work better if the navy is next to your face). I always feel it is quite Parisienne to wear the two colours together….but be careful if you are very fair in colouring as this combination of colours will be too dark for you. These trousers are so flattering and so easy to get lots of use out of. You could wear them to the office with a shirt, jacket and stack heels….but then dress them down with trainers and a Bretton tee shirt. However- to do this you might need to get clever with a simple hemming solution like this option! The style will suit those of you with curves and they even have an elasticated waistband which, while not the most sophisticated- certainly brings much joy to ones day -covered with a belt- no one will know! Be careful: if you are very straight in your shape or have a very small bottom as you will get lost in these; they will hang off you and will do nothing for you. 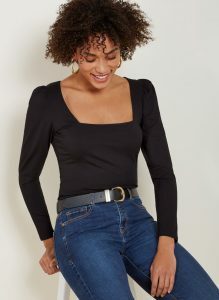 Both of these tops have great necklines for different reasons..
Square neck- is a great cut for those of you with a full bust. It is cut low enough so that if black is a not the best colour for you- there is space to fit a necklace in to add a bit more colour next to your face. The puff on the shoulder is so flattering as will make your shoulders look more defined and with more shape. A TOTAL wardrobe staple for so many….as you can wear them with so many items and to so many occasions. With jeans, trousers, dresses and skirts – they always deliver. They INSTANTLY update your look. You could be wearing jeans and a tee shirt- but the moment you put on a biker- you feel more put together and just cooler (well I do anyway! Be careful: if you have a full bust as the zip and lapel combination could mean the girls are too hemmed in and the leather will pull. 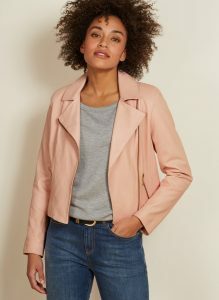 Always make sure you can do the jacket up easily- even if you aren’t going to wear it done up…it just means it will hang properly and not either side of your bust. Need I say more? There are very few items in a wardrobe as useful and so universally easy to wear to so many occasions. This style is great for those of you with curves as it is cut to your shape. Worn with smart trousers and heels for work or dressed down with a denim shirt and pleated skirt at the weekend- it will always deliver and help you to feel “finished off”. Be careful: if you are petite – make sure the length is not too long for you as if it sits too much on your thigh it will make you look shorter. Also be careful if you are bottom heavy or hold weight on your thighs as the length could draw attention to this. I could go on and on actually as there are so many gorgeous pieces that are worth the investment and place in your wardrobe! I have filmed “trying on sessions” of various pieces from the collection and have loaded them onto Instagram – and will be doing more over the next few months talking you through them and giving advice- so if you want to watch these go to my Instagram account and click on the “Baukjen Highlight” ring below my profile. If you want to buy any pieces from the collection I have a 20% discount code “KATE20” to use for the next three months- so you have time to make your purchases. In the meantime- any questions/feedback/thoughts- do let me know…always love hearing from you.